Feeling like you're in a slump? Want to up your reading this month? Join us for a month-long reading challenge: YES WE CRAB*. If you follow me on Twitter, you have probably heard me talk about ILOA. ILOA (International Library Of Awesome) is my very best librarian support group. These ladies are the bomb (and I wouldn't have met them except that we all belong to ALA, which is exactly why I renew my rather expensive membership every year). And we got to talking about our reading this year and we're feeling like we need to crank it up a notch. Set your own goal! Grab this adorable graphic! 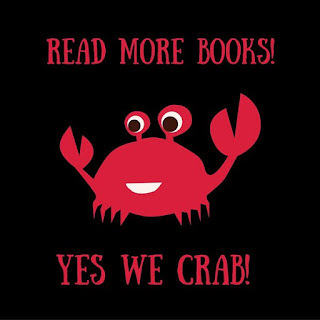 Tweet with the hashtag #yeswecrab! I'm aiming to read 20 books this month and write up posts for my fall storytimes. Can we do it?! Yes we crab! * Why "Yes We Crab"? Because it's adorable and it's February so we're a little punchy, okay?